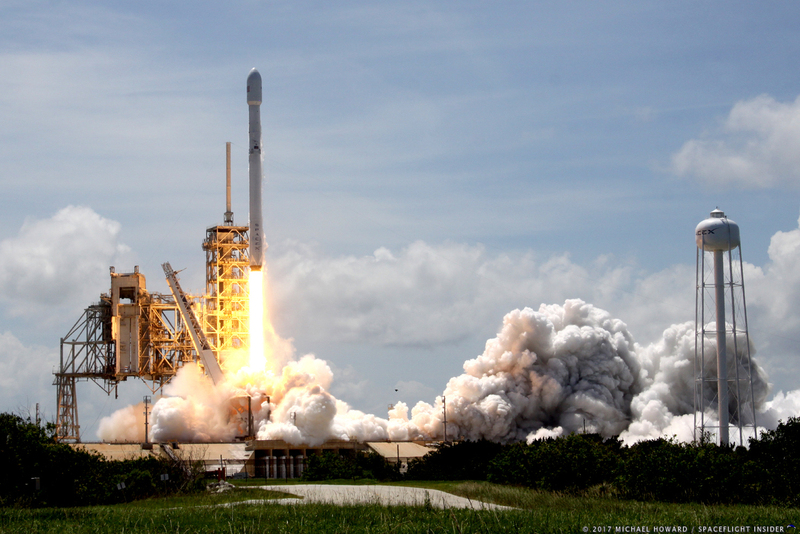 CAPE CANAVERAL, Fla. — Perhaps the best word to use to describe the launch tempo for Hawthorne, California-based Space Exploration Technologies (SpaceX) would be: relentless. 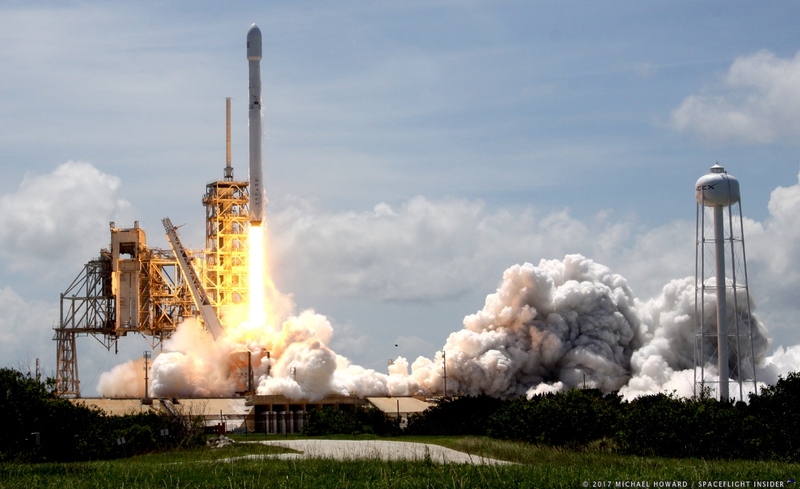 With a mission launching about every two or three weeks from Kennedy Space Center’s Launch Complex 39A, the flight of the Bulgariasat-1 mission on Friday, June 23, only served to underscore that theme. 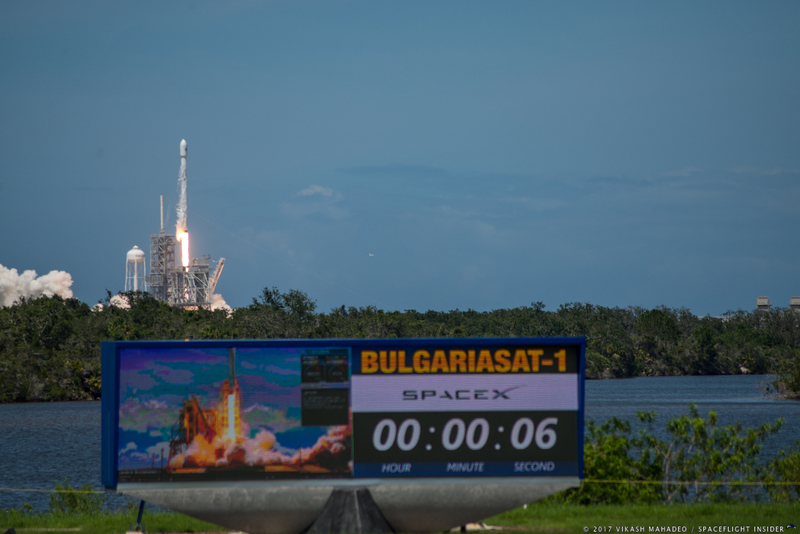 The payload for this mission, the Bulgariasat-1 communications satellite, is the first geostationary satellite to be launched for Bulgaria and will be placed into a geostationary transfer orbit (GTO) by its Falcon 9 “Full Thrust” launcher. The flight got underway at 3:10 p.m. EDT (19:10 GMT) – midway through a roughly two-hour-long launch window that the NewSpace company had available to them. A backup launch date of Saturday, June 24, was also available but unneeded. Today’s flight had been slated to take place an hour earlier, but with two hours in the launch window, SpaceX mission planners opted to push the launch back one hour. As noted, the mission started its 35-minute trek into the black from Kennedy’s historic Launch Complex 39A. This marked the 101st flight to be sent aloft from the same site where the crew of Apollo 11 lifted of for the Moon. SpaceX has redefined the paradigm that launch service providers have operated under with its reusable operations. These have seen several – prior to today, SpaceX has had 11 successful landings: 5 on land at Cape Canaveral’s LZ-1 and 6 on drone ships (5 on Of Course I Still Love You and one on Just Read The Instructions) – of the Falcon 9’s first stages return to either Landing Zone 1 (formerly Cape Canaveral’s Launch Complex 13) or the Autonomous Spaceport Drone Ships, Of Course I Still Love You (Atlantic) and Just Read the Instructions (Pacific). Prior to today’s flight, SpaceX’s CEO and Founder, Elon Musk, stated that the chances of a recovery of the first stage were slim: “Falcon 9 will experience its highest ever re-entry force and heat in today’s launch. Good chance rocket booster doesn’t make it back.” However, battered and blackened, the stage successfully landed about eight-and-a-half minutes after liftoff. The first stage of the rocket on this mission was also the core that carried out the sole successful landing out in the Pacific after the launch of the January 2017 Iridium-1 mission from California. The booster was refurbished and retested (via a static test fire on June 15) preparing it for today’s flight. Like an old friend waiting to pick up their acquaintance after a long voyage, the Of Course I Still Love You waited patiently out in the Atlantic Ocean for the Falcon 9 first stage to arrive. Meanwhile, high above, the SSL-built Bulgariasat-1 was starting its planned 15-year service life. The spacecraft was launched to provide direct-to-home television (DTH) and data communications services across the European region, the Balkans, Middle East, and North Africa. Given the national branding of this mission, it should come as no surprise that the satellite will be placed at approximately 1.9 degrees East longitude – the Bulgarian orbital position. The satellite is being launched so as to provide broadcast and telecom services to corporate and government customers. Bulgariasat-1 sports 30 Broadcast Satellite Service (BSS) Ku-band transponders and two Fixed Satellite Service (FSS) Ku-band transponders and is based on SSL’s 1300 series platform. At about one hour and 13 minutes prior to liftoff, SpaceX’s launch conductor carried out a readiness poll to see if everything was in place to support a launch. Three minutes later, a highly refined form of kerosene, known as “RP-1”, was loaded into the Falcon 9. Fifteen minutes after that and the Falcon 9 was loaded with liquid oxygen (LOX). At seven minutes prior to launch, engine chill down was initiated. Just one minute before launch, the Falcon 9’s command flight computer started final prelaunch checks – clearing the way for liftoff. Also at this time, the pressurization of the Falcon 9’s propellant tanks got underway. Fifteen seconds later, SpaceX’s flight director verified that they were “go” for launch. At a mere three seconds prior to the rocket leaving the pad, the engine controller ordered the engine ignition sequence to start – and then flight. About a minute and 19 seconds or so into its ascent, the Falcon 9’s speed, coupled with the very air that surrounded it, conspired against the rocket – placing it under the greatest amount of stress during the flight “uphill”. This area is known as “maximum dynamic pressure” or, more commonly, as “max Q”. With this period of the mission complete, the next milestone that the rocket needed to achieve was first stage main engine cutoff, which occurred at two minutes and roughly 36 seconds after the F9 had left the pad at LC-39A. 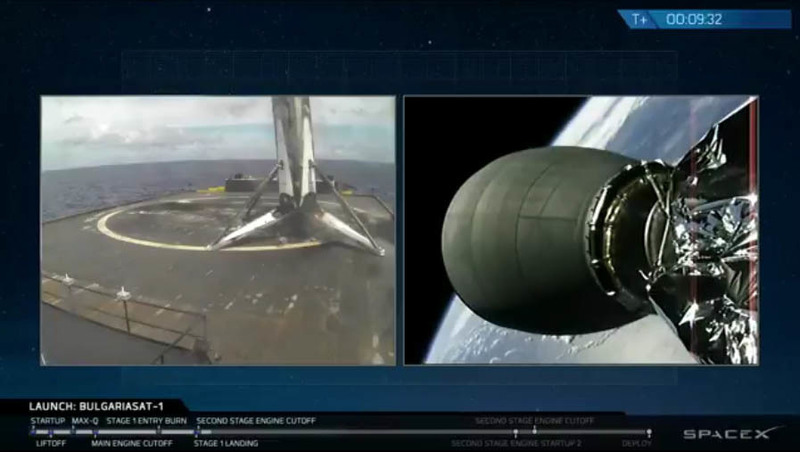 Four seconds after this, the first and second stages separated. The second stage then activated its Merlin 1D engine and began its part of the mission at about two minutes and 47 seconds after launch, the payload fairing, that protective cover that shielded Bugariasat-1 through the turbulent Florida atmosphere was ejected about 53 seconds later. At eight minutes and 38 seconds in, the first second-stage cutoff took place, it reactivated at 27 minutes and eight seconds mission elapsed time. This was followed a minute and five seconds later by the second, and final second stage cutoff of the flight. At approximately 34 minutes and 55 seconds after it had left the pad – the one that had sent Neil Armstrong, Buzz Aldrin, and Michael Collins on their historic voyage to the Moon – Bulgariasat-1 was deployed. The first stage, meanwhile, was still working its way back “home” with an entry burn conducted at about six minutes and twenty seconds into the flight. Two minutes later and the ASDS was “feeling the heat” from the central one of the nine Merlin 1D engines as the Falcon 9 touched down. As if to reinforce the frenetic launch tempo that SpaceX is operating under, the company has another flight, that of the Iridium NEXT 2 mission, currently set to take place from Vandenberg Air Force Base’s Space Launch Complex 4E (East) on Sunday, June 24, at 1:24 p.m. PDT. There are some 12 missions currently on SpaceX’s 2017 launch manifest remaining.